Yes, you can program your Atmel ATmega-based Orangutan with your Mac! I'm using a Pololu Orangutan LV-168 to control Pokey the robot and programming it with the Pololu USB programmer. Works great! I recently updated the AVR toolchain / programming environment on my Intel-based MacBook running OS X 10.5 "Leopard" and so I've updated this article. Here's the play by play. Huge thanks to Dennis Clark for guidance and setting me on this path in the first place!!! Updated Feb 28, 2010 for Mac OS X 10.5 "Leopard" and OS X 10.6 "Snow Leopard"
I suggest obtaining the tools in the form of CrossPack for AVR from Objective Development. It will support the new Orangutan library (libpololu-avr) and the new ATmega328P-based controllers. The latest version of CrossPack AVR as of this writing is 2010-01-15 and includes avr-gcc 4.3.3, avr-libc 1.6.7, avrdude 5.8, and simulavr 0.9. It's based on WinAVR 20100110. The old Mac OS X AVR is no longer available and MacPorts' avr toolchain is a couple years out of date. The CrossPack AVR suite comes as a disk image with a Mac OS X package installer. It's a matter of opening the disk image then double-clicking the package and going through the prompts. Tremendously simple, way more so than MacPorts ever was. Both avrdude and simulavr are also included. Neato! The new versions included in CrossPack AVR will make the above errors go bye-bye. CrossPack AVR installs in the directory /usr/local/CrossPack-AVR.You'll want to set up some environment variables to make sure everything works properly when you compile the libpololu-avr libraries. While we're at it, let's set up the MANPATH too. And, we'll want to set up the C include path. We could try to set up the LIBRARY_PATH but the CrossPack AVR linker seems to ignore this environment variable. Close your current shell and open a new shell window for these changes to take effect. You can skip this step if you don't plan on programming an Atmel ATmega328P microcontroller. The version of avrdude that comes with CrossPack-AVR doesn't support the ATmega328P out of the box so you need to edit the config file and add a section defining it. This link describes the process. Edit /usr/local/CrossPack-AVR/etc/avrdude.conf and add the text in this link at the end of the file. You'll need to download the Orangutan USB programmer drivers for OS X as well as the new library for Orangutan controllers (libpololu-avr) from Pololu's website. The drivers come as a .dmg disk image file. Download the disk image and open it. After the disk image mounts, double-click the "Pololu Installer" icon and follow the directions from there. You'll need to restart your computer when the installation is done. If you are using a different programmer, you'll have to follow the manufacturer's instructions for getting it ready to use for downloading code. # sets INCLUDE_POLOLU and LIB to a directory of your choice. Optionally, you can compile the Pololu library from scratch using the command make clean to wipe everything and then make to recompile using CrossPack AVR's avr-gcc 4.3.3. Next, install the libraries with the command sudo make install. Enter your password when prompted. The compilation succeed with no errors. (Note, version 4.0.2 gave me numerous errors and warnings compiling these libraries as mentioned above). Let's try compiling one of the Pololu examples that come with libpololu-avr. Before we can do that, we have to edit the Makefile. You'll need to do this with any Makefile you create. First, we need to fix the linker's search path. As mentioned the linker ignores the LIBRARY_PATH environment variable, so edit the Makefile to add the CrossPack AVR directory to the library search path. Set (or add to) the LIBDIRS variable, which is used to list -L switches which add the specified path to the linker's search path. 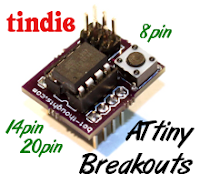 Instead, if there's a DEVICE specified, make that atmega168 (etc). The example I looked at uses an AVRDUDE_DEVICE set to m168. Note that the CrossPack-AVR avrdude will recognize the device atmega168 so you can simplify your project makefiles by using a single variable (like MCU) for both the avr-gcc and avrdude command lines. The variable SERIAL or PORT should be defined in the Makefile as /dev/tty.Pololu. Then make sure that the CrossPack AVR version of avr-gcc is in your path via the command which avr-gcc and if not, did you set up the path variable correctly from Step 1.1? Did you open a new shell window? The argument following the -p is the part number and should be atmega168 (or m168), atmega48 (m48), etc. Note that this version of avrdude doesn't support the ATmel ATmega328P microcontroller out of the box, see Step 1.2 after which you can specify atmega328p (m328p) as a part. The argument following the -P is the serial port; On Mac OS X, do an ls of /dev/tty* and you will see the Pololu serial device driver of your Orangutan USB programmer (it should be /dev/tty.Pololu). The programmer ID is specified using the -c option and should be avrispv2. The -e option results in a chip erase and the -U option is used for writing, reading, or verifying flash, EEPROM, fuses, or lock bits. In this example we are using -U to write test.hex to flash. If you plug in and turn on the Orangutan, the program should be written into the microcontroller's flash memory. Note that the avrdude command includes the -q option which suppresses the progress indicator hashmarks. Use this switch when using Emacs. avrdude: reading input file "servo.hex"
Now that you can compile code and download compiled binaries, you need to be able to write code so you need an editor or IDE. But... which editor to choose? I have been an Emacs geek for 20 years (yikes, I'm old!) so needless to say it is my Integrated Development Environment (IDE) of choice. But it is all text-based. Yes, it is an IDE; you can make / compile code, step through errors, run software, and do anything else you can think of (since it is readily extensible), all within the editor. It is fast and very lightweight (thanks to Moore's Law). It's old school, but if you learn it well it's quick to use (hey kids, you may not remember the days before menus and mouses, but there are some things that are much faster using keyboard shortcuts). Here's a reference card with emacs key combinations: http://www.geek-girl.com/emacs/refcard.html. Fortunately, you'll find emacs on your Mac but working with many files at once is challenging. Instead, may I suggest you try my preference, Aquamacs, a try: It's Emacs with an Aqua interface. It's quite decent and it puts each file (module, header, etc.) in a separate OS X window. I found this tool really improved my productivity -- and protected my sanity. Another option is the Xcode editor. David Beck's Blog has some good information in setting up an Xcode project template with CrossPack-AVR. And still another option is to use Eclipse, a fantastic, popular, open source, java-based, GUI IDE. It's a pretty big application, takes a while to launch on slower systems, but it is extremely flexible, very nice to use, and powerful. They offer a version with C/C++ plugins that you'll probably want to use for AVR. One of the folks in a local Colorado robotics club, Dennis Clark, has configured Eclipse to handle both the coding and downloading/programming for AVR. I have the plugins installed but would like to configure it for programming the AVR at the press of a button as Dennis did. Still working on this. So there you are. If you go through the above you should be good to go in programming your Atmel ATmega, whether an Orangutan like I'm using, or whatever else. Happy Atmel AVR programming! Big thanks to Mike Seeman's guide on AVR software for Mac OS X. It's a good guide and you should have a peek. Since I needed to get my environment set up for the Orangutan anyway, I wanted to document the experience and provide an updated, simpler guide using MacPorts, in case it helps someone out there, someday. Pokey's broken. The heat of firefighting competition a couple years ago--accidentally bashing into walls at full speed in particular--left Pokey's otherwise excellent Tamiya Double Gearbox in sad, noisy shape. 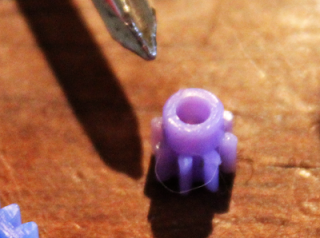 A quick exploratory surgery revealed that both plastic 8-tooth (8T) pinion gears are cracked. Rats. 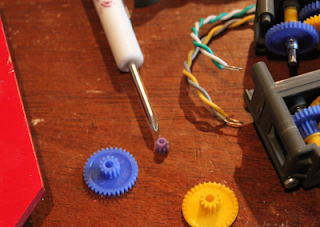 Fortunately, Tamiya has an inexpensive replacement set of plastic and metal pinion gears, TAM15289, Mini 4WD 8T Metal and Plastic Pinion Gear Set. Cool. The set I ordered arrived a few days ago and after installation, Pokey's geartrain is restored to full, smooth, silent health. Next up, equipping the plucky little robot with bluetooth remote control and telemetry capability. Articles to follow. Incidentally, there are other pinion gear alternatives. You'd need a 48 pitch, 8T pinion gear for 2mm shaft. I don't know how to measure pressure angle or pitch diameter, so I guess you'd have to experiment such as with gears from this web store or maybe this one. 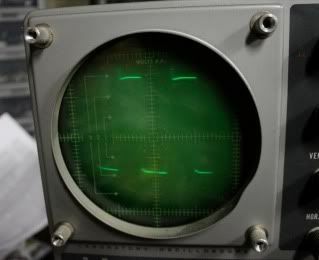 I'm happy to report that I got my Heathkit IO-12 vacuum tube oscilloscope working! It probably needs some additional tweaking, but I learned what I needed to learn about reviving vacuum tube (valve) gear. Why start with an oscilloscope? I was already familiar with how they work and they are sort of self-diagnosing, unlike audio gear. What displays on the screen gives pretty good clues to the problems. So troubleshooting was much easier than it would have been on less familiar equipment. SAFETY: before doing anything with this unit, I made darned sure I played it safe with the literally deadly voltages inside. Most of the supplies range from 100V to 370V, with the video filament driven by a 1500V supply!! Always make sure the machine is unplugged and capacitors drained before working on it. Use one hand behind your back if you must work on the machine when it is on. You don't want electricity going in one hand, through your heart, and out the other hand. Do your own research to be sure you are taking appropriate safety precautions. The process I took was to follow the schematic an first replace all the old capacitors with new ones from JustRadios.com (they happened to have a big enough selection that I could order everything from them). I had to track down a bunch of tubes and got some from friends, and quite a few from eBay. 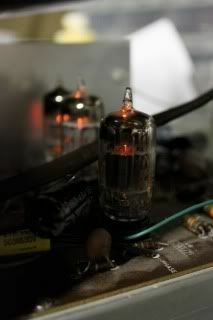 When I finished replacing capacitors and installing tubes, I had some troubleshooting to do. Supply voltages were too high. 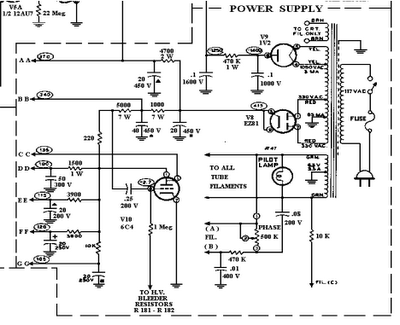 The schematic calls for 117V supply but AC here at the house is 125V. This scope like many vacuum tube machines use tube diodes and primitive resistor-capacitor networks to rectify and regulate voltage. So high mains voltage means high internal supply voltages which can burn up tubes and cause other trouble. 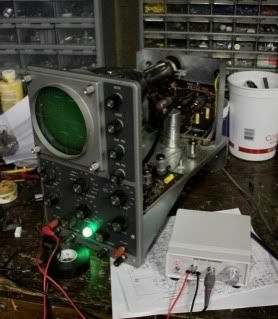 (See the power supply circuit below; AA through GG are the supplies; 1V2, EZ81, and 6C4 are all vacuum tube rectifiers). One can use a bucking transformer configuration or zener diodes of appropriate wattage to drop the AC input voltage to ensure the supply voltages are within spec. I happened to have bought some 5W, 10V zeners, and they dropped the voltage to an appropriate level. I then had to try a couple different tubes in the vertical section but pretty quickly got the trace above. There's little chance of this device replacing my solid state oscilloscopes, and there's not really any practical application of vacuum tube circuits to robotics... but it was a fun project and a good way for me to dip my toes into the wonderful world of tube circuits. The next tube project is a Heathkit frequency generator. After that, a couple of amplifiers.